This paper presents the exciting discovery of the first high redshift (z>5.7) quasar discovered by the Panoramic Survey Telescope and Rapid Response System 1 (Pan-STARRS). Morganson et al. discovered the quasar by examining Pan-STARRS images of the sky taken in y, z, and i bands and looking for objects that “dropped out” of the bluer bands but appeared in the redder bands. The first Pan-STARRS quasar is an i dropout, which means it was detected in z and y but not in the bluer filters (gri). The newly detected quasar is a Broad Absorption Line quasar at a redshift of 5.73 +/- 0.02 with a z band magnitude of 19.4, a luminosity of 3.8×1047 erg/s, and an estimated black hole mass of 6.9×109 solar masses. Postage stamp images of PSO J215.1512-16.0417, the first quasar discovered by Pan-STARRS. 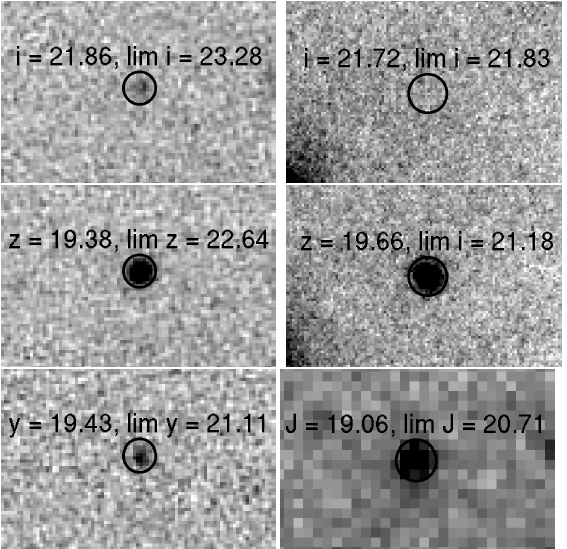 The images on the left are Pan-STARRS discovery images in i (top), z (middle), and y (bottom). The images on the right are follow-up images from GROND in i (top), z (middle) and J (bottom). Figure 2 from Morganson et al. 2011. As Dan explained in his astrobite about Lyman-break galaxies, between recombination at z~1100 and reionization at z~6, the universe was filled with neutral hydrogen. As light from a high-redshift quasar travels toward us, the light emitted blueward of the 1216Å Lyman-alpha line (the n=2 to n=1 transition in neutral hydrogen) redshifts into the same wavelength as the Lyman-alpha line and is absorbed by any patches of neutral hydrogen it encounters. The point in the spectrum where the absorption begins is known as the “Lyman-alpha break” because there is lots of flux redward of the break and no flux blueward of the break. If we then measure the flux of the quasar in two bands, one on the redward side of the Lyman-alpha break and one on the blueward side, we would detect the quasar in the redder band but not in the bluer band. If the bluer band were called the “X” band, then we would say that the quasar was an “X band dropout” and we would calculate the redshift of the quasar by comparing the rest-frame wavelength of 1216Å to the observed wavelength of the Lyman-alpha break. The quasar announced in this paper isn’t the highest redshift quasar found, but it is the first quasar discovered by Pan-STARRS and is likely to be followed by many others. The Sloan Digital Sky Survey (SDSS) has been very successful in finding quasars at z~6 using observations in ugriz, but Pan-STARRS should be able to find quasars at even higher redshifts due to its greater sensitivity in z band. Furthermore, the reddest filter used by the SDSS is z, but Pan-STARRS includes a near-infrared y band filter and is therefore capable of detecting z dropouts (z~7) in addition to i band dropouts (z~6). Pan-STARRS is still in its early stages, but the full survey will include coverage of 3/4 of the sky in five bands (grizy) between 4000Å and 10500Å. Given current estimates of the frequency of quasars as a function of luminosity, Morganson et al. expect that Pan-STARRS will find approximately 200 quasars with z>5.7! The Pan-STARRS catalog is still a work in progress, so Morganson et al. have to do some of their work the hard way. They begin by looking for all sources that were reliably detected in either y (for z dropouts) or z (for i dropouts) but were either undetected or 1.5 magnitudes fainter in the dropout band. They are careful to exclude false positives such as cosmic rays, saturation defects, and blended sources and they avoid considering sources within 10 degrees of the galactic plane to reduce their false positive rate. Morganson et al. then examined images of the remaining 3000 candidates by eye(!) in order to rid their list of candidates of any undetected cosmic rays, marginal detections, and image artifacts. After what must have been many long hours of work, they ended up with a prioritized list of candidates based on their level of confidence in the detection, the magnitude difference between the dropout band and the redder band, and feasibility of follow-up observations. Morganson et al. have conducted follow-up observations of roughly 200 of their candidates using the MMT SWIRC (Multiple Mirror Telescope SAO (Smithsonian Astrophysical Observatory) Wide-field InfraRed Camera) and the grizJHK simultaneous imager GROND (Gamma-Ray Burst Optical/Near-Infrared Detector) on the 2.2m telescope in La Silla, Chile. For the most promising candidates, they also conducted spectroscopic observations using the MMT Red Channel Spectrograph and the Cassegrain Twin Spectrograph on the 3.5m Calar Alto telescope. Of the fourteen candidates that received spectroscopic follow-up, Morganson et al. identified three galaxies, ten M, L, and T dwarfs, and one quasar. They performed additional near-infrared spectroscopic follow-up observations of the quasar using the Large Binocular Telescope (LBT) to estimate the slope of the continuum and look for features in the near infrared. The resulting power law fit to the continuum (λ-3.05) suggests that the Pan-STARRS quasar (PSO J215.1512-16.0417) is much bluer than other z~6 quasars. After modeling the continuum, Morganson et al. fit the lines in the quasar spectrum and compute a bolometric luminosity of 3.8×1047 erg/s for the quasar. They then determine the corresponding Eddington Mass and assume a typical Eddington ratio of 0.43 to find a black hole mass of 6.9×109 solar masses.